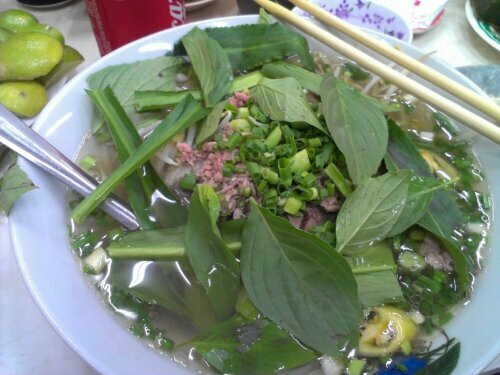 Pho Hoa @Pasteur (Ho Chi Minh City, Vietnam) | Get Your Grub On! Visiting Pho Bo At Home! Some friends and I spend a weekend over in Saigon or Ho Chi Ming City in Vietnam for a birthday celebration and visiting a common friend at the same time. It was a weekend full of fun and delicious food but there was one particular place I heard a lot about before and which I definitely wanted to visit, ‘Pho Hoa’. On our last day and as our last meal in Vietnam we made the trip not far from our hotel to the very beginning of Pasteur Street where this shop is located. When we arrived all the tables were pre-stacked with a big plate of herbs like basil, mint and mustard leaves, lime wedges, youtiao the fried dough sticks, bean sprouts and other dishes like ‘Vietnamese Wedding Cake‘, ‘Steamed Meat Cakes’, bananas and so on. I went for a mix of ‘Pho Tai‘ (raw meat) and ‘Pho Chin‘ (brisket) which came out the kitchen corner steaming hot. After mixing in herbs, chilis, lime juice and sprouts we started slurping. It was very nice and clean but I was hoping for more cinnamon which I think gives this dish a special twist. Nevertheless it tasted really nice. The noodles were ok but nothing too special about them. The brisket was nicely tender and long cooked but a little fatty on the edges. My favorite though was the raw meat. On the picture it looks like mince but it was super lean and lovely tender and juicy, so if I should come back here in the future this is the one I’m gonna get. Overall this place is pretty good and I would definitely come back again but I might have overhyped my expectations as so often and was left slightly let down by the lack of cinnamon. I still really liked it and hope that Singaporean pho shops will also start offering herbal plates for self service eventually as I love my pho rather leafy. For more of my pictures of ‘Pho Hoa’ and the other food from our Saigon weekend check out my twitter (#phohoa, #saigonfood).